HFT 'FIREBUSTER' for the Ultimate in HOME PROTECTION! The right pressure to do the job safely! Dual Fire Hose Lines for added SAFETY! 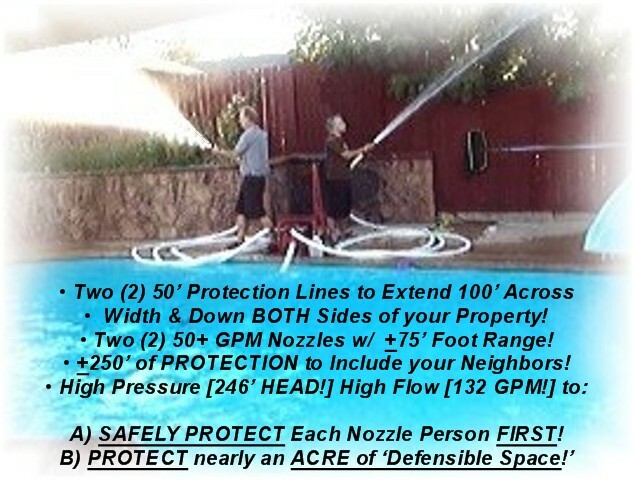 Pretreat your Defensible Space more effectively! 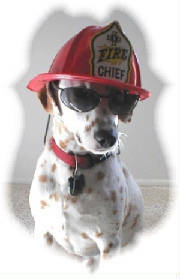 TWO (2) Fire Protection Lines to protect You and a 'Buddy' FIRST!!! 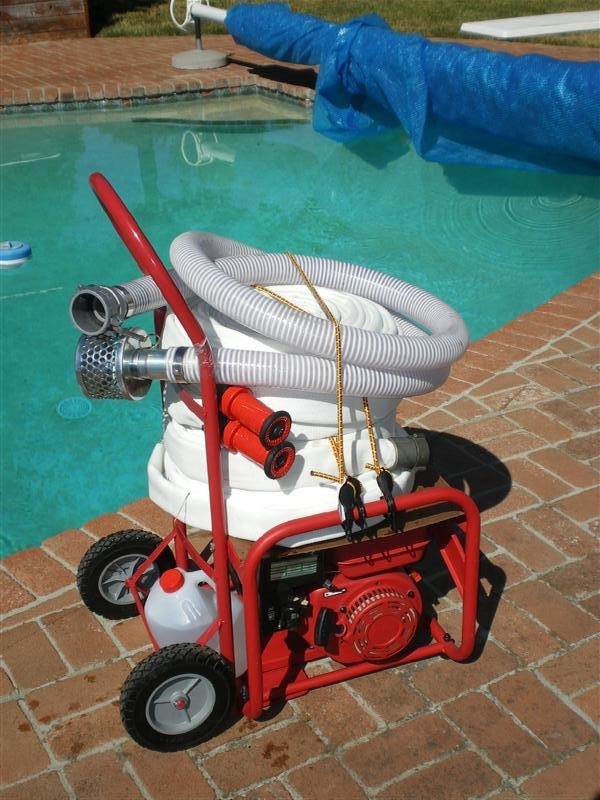 Pool Owners and Pool Service Technicians - Click here to DOWNLOAD information describing the benefits of this Pump System and important Fire- and LIfe-Safety Tips that literally every family should review to be Fire Safe! List $2395.00! Now $200.00 OFF! $2195 DELIVERED to your door! SAVE HUNDREDS on this EXTENDED SPECIAL! That's right! I pay all shipping and any applicable sales tax! Click here to purchase the absolute BEST Fire Home Protection System on the market today! As a committed service to my fellow citizens, one price for delivery to any address within the lower 48! To Top it off, buy Eight (8) get one (1) FREE! ...buy Fifteen (15) get two (2) FREE! Everyone's SAFETY is our primary concern! Order TODAY! Remember, every 'recommendation' generates a $100.00 Referral Fee! From my family to yours, all our BEST! Use this PayPal icon to order additional 50' foot lengths of 1.5" inch Double Jacket hose [for added durability] with Fire Dept. compatible couplings. Price includes UPS Ground shipping and any applicable taxes. Hazard Control Technologies F-500 is a Class 'A' & 'B' UL Listed agent that not only produces revolutionary results in Fire Combat, but it rapidly reduces heat and improves visibility as it interrupts the combustion process at the source to exponentially yield increased Personnel SAFETY! An absolute ASSET with the HFT 'Fire-Buster' Fire Protection System! The BEST Class "A" and Class "B" Fire Extinguisher... EVER! 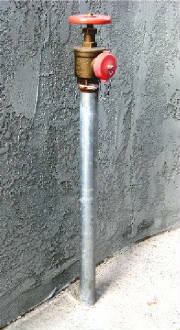 ...most effective Fire Protection Pump System on the market today! Be the FIRST on your block to protect your home with the power of a 6.5 Hp Pump that produces the right Volume [132 Gallons Per Minute] at the right Pressure [246' Maximum Head] to do the job both SAFELY & Effectively! Watch what the local news media says about Home Fire Protection Pump Systems as these! An industry FIRST w/ TWO (2) LINES of PROTECTION! You know the POTENTIAL where you live! Are you one who WAITS for that first FIRE ENGINE to arrive!?! Reality is that sometimes there's just never enough Fire Engines to protect every exposed home! What are you willing to do to protect yours!?! Click here to learn what a Fire District has done to protect the entire perimeter of a Home Owners Association! 'DEFENSIBLE SPACE' - Why 100 Feet! ...you can do nothing to prevent the inevitable! What an absolute trajedy! 25,000 gal. H2O WASTED! Our COMMITMENT is you'll never experience this! 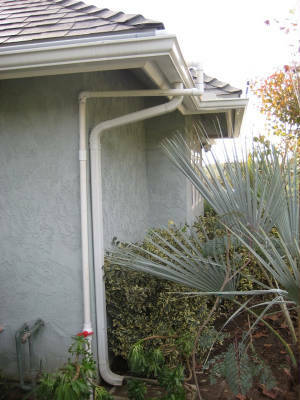 Nearly every drop can be used to PROTECT your home! 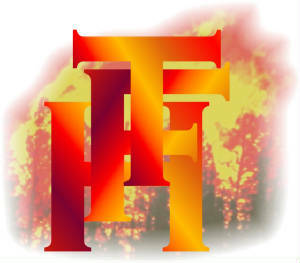 The 'Institute for Business and Home Safety' asks, "Is your home SAFE from Wildfire!?!" How to Protect your Home Against Wildfire Damage! * Few realize a typical 25,000 gallon pool is equal to the water of FIFTY (50) Fire Engines parked in the backyard! Yet remains virtually useless without an independent pump system capable of delivering the pressure and volume necessary to do the job! * SAFETY FIRST! Always use the BUDDY SYSTEM! * We Never Swim Alone - We Never Fight Fire Alone! 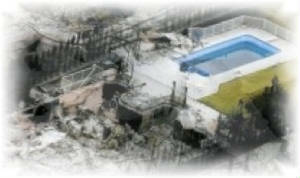 * An Industry FIRST w/ Two (2) Fire Protection Lines! 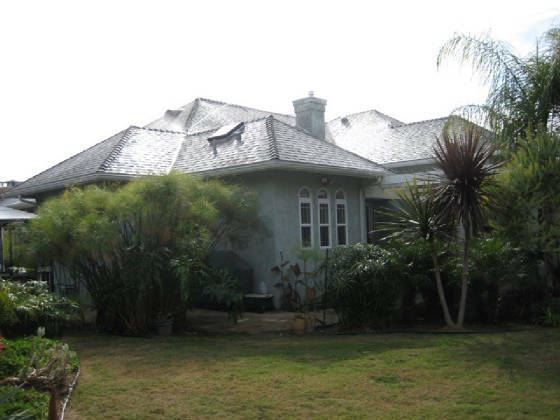 * Protect over a FULL Acre PLUS multiple buildings w/ optional 'Fixed' System as shown below! * Secure a true 'Shield of Protection' as studies have proven that even the newest and most Fire-Resistant homes are still vulnerable to wind-driven falling burning embers that can travel great distances and still somehow find their way into the smallest of cracks and crevices between non-flammable building materials only to end in COMPLETE DISASTER! * Firefighters will likely give your home higher priority and thus 'Select to PROTECT' your home as a 'SAVE' when compared to the many others that are not so equipped! * A fully installed System [below] could be a significant factor when calculating and thus help to lower your Fire Insurance Rates! * If a mandatory evacuation order is given, you [or any potential fire victim] can evacuate w/ the Peace of Mind you know you have provided Firefighters with one of the absolute BEST systems available on the market today for HUNDREDS LESS than you'd expect! Simply the SAFEST and BEST at this price! Earn a $100.00 'Referral Fee' just for mentioning this product! Please click here to request pre-printed Postcards to forward to our potential customers. Remember, each closed sale will generate a $100 Referral Fee to you! ...to supplement your Fire Insurance!?! 'REALITY' we exchange in rural areas! Click here to watch a backyard swimming pool [with the water of DOZENS of fire engines!] create a 'Safety Hazard' as these fire fighters lose homes in the same neighborhood! Do we not have a 'DUTY' to utilize every resource to it's FULLEST potential!?! Please click below to view a must see video that demonstrates we have finally arrived at the END of Wildland Fire Home Losses! 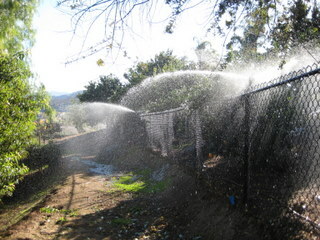 Compare this water flow to a garden hose... and then to a Fire Engine that may [or may NOT be available!] to protect your home! You know the potential of where you live... be another satisfied customer! I guarantee this pump meets every specification! Let us help you protect you and your loved one's with an industry FIRST! Watch as these DUAL Protection Lines help protect MULTIPLE additional adjacent properties! This second video is very important as it demonstrates water can be pumped to simultaneously support one (1) Protection Hand-Line PLUS an Exterior Sprinkler System! ...a true SHIELD of PROTECTION that studies have now proven it is the smallest of falling burning embers that penetrate the slightest openings in Fire Resistant building materials that leave literally every structure vulnerable. Just watch as these 360 degree FULL Pattern three (3) gallon per minute sprinkler heads spray small water droplets in a manner that will follow the exact path of a wind driven ember into these same tiny openings and cracks! When combined with strict adherence to the 'DEFENSIBLE SPACE' regulations listed above and the supplement of F-500 Class "A" and Class "B" Foam listed below, I think we can all agree we have finally arrived at a time in history in which we truly have a fighting chance during extreme Fire Behavior! Have alot of area and/or more than one building to protect? This SYSTEM below protects two (2) structures over 900' apart on 15 acres in a severe Wildland Fire Threat area! Installed is a pre-plumbed 2" Hydrant System complete with 1.5" Standpipes placed strategically at every potential Fire Threat FRONT! You already know the direction a fire is likely to approach! Install this system and inform your local Fire Station they now have an ADDITIONAL pressurized large capacity water source in their Initial-Attack area! Your equipped home will then likely be one of the very few fire fighters have an actual chance to protect to ensure 'We' triage your home as a 'SAVE!' Not only reduce your Fire Insurance Rates, but convert your property into an Fire Protection ASSET! Learn how to PROTECT two buildings on 15 acres! 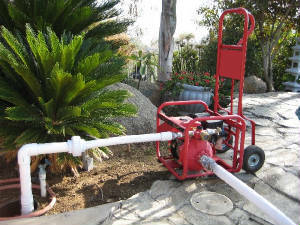 This Pump can 'Charge' over 1000' of a 2" Hydrant System! ...can be placed at every area that presents possible a Fire Threat Front! ...able to be deployed in any direction up to the length of the hose! ...to accomodate any configuration necessary! ...can fully protect multiple properties hundreds of feet apart from one another! Now in as many simple words, "Just Add Water!" ...and your Proterties are Protected! 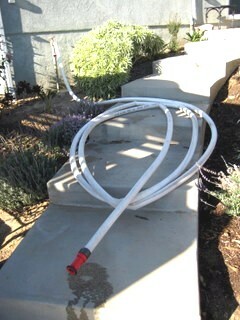 ...separate sprinkler heads w/ over two (2.5) and a half hours of water from a 20,000 gallon pool! And just when you thought you heard it all! The absolute MOST EFFECTIVE Class "A" and Class "B" Foam in the world today! UNBELIEVABLE! Truly, what is your home and valuables worth!?! Important facts every home owner should know regarding 24/7 protection from interior Residential Fire Sprinkler Systems! Do you honestly want to WAIT and HOPE this doesn't happen!?! Do you KNOW these personnel will be arrive in time? ...or at all!?! Just another reminder!?! Does this look like your backyard!?! What's a few EXTRA THOUSAND gallons of WATER worth!?! Area Ignition! What can you DO to SAFELY PROTECT your...!?! 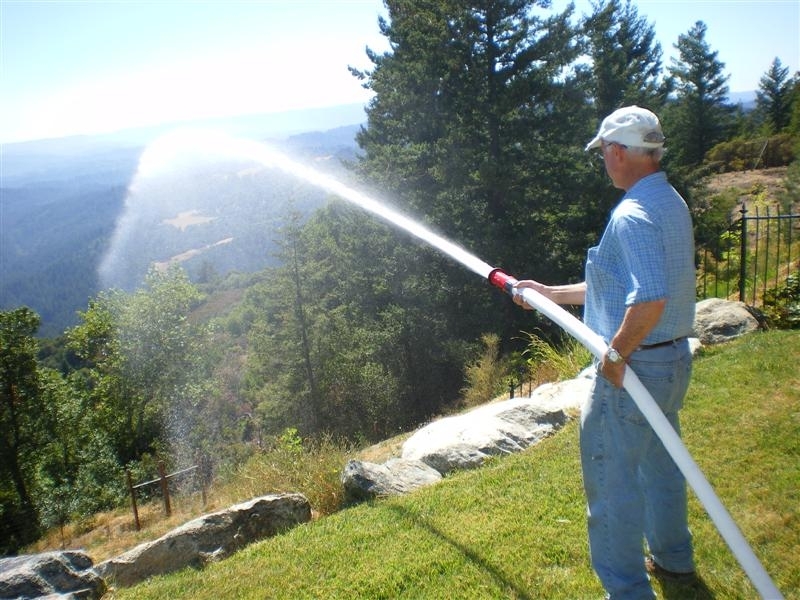 Consider this incredible video... Do you honestly believe there will ever be enough resources within driving range of your home to pump large quantities of water to prevent the Cedar Fire DEATHS - 'Time-Lapse' of one day in history! Have you done all you can do to PREPARE for this Fire Season!?! 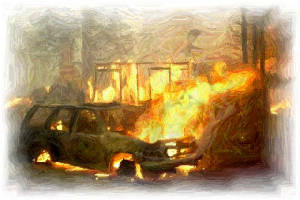 A final look at the Cedar Fire 2003 - The futility of a Garden Hose! Notice: We do not recommend that anyone engage in the suppression of a fire! This is the job of highly trained Fire Department personnel with all appropriate apparatus and equipment. 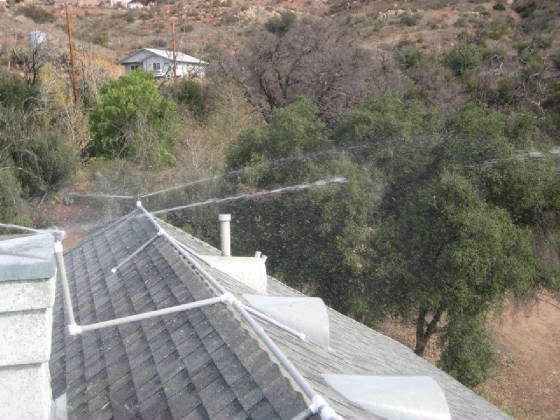 We do, however, recommend that you prepare your property to every specification that not only meets but exceeds local ordinances including a 100 Foot Defensible Space and by further wetting or applying foam to as much of this area as possible before the fire approaches. If you are in any danger and/or under any voluntary or mandatory evacuation order, we recommend strict adherence by all to evacuate to a safe area without further delay. BE FIRE SAFE... FIRST!